I painted a very rosy picture of our campsite Domains Les Gandins yesterday. It's only got better and better. So much so in fact that I've pleaded and pleaded with Tony to let us stay longer. I'm pleased to say he finally gave in and we'll depart on Saturday and not Friday as originally planned. It's been gloriously sunny and yesterday we did nothing except lay in the sun and drink beer, have a swim in the pool, and play a little bit of table tennis (we've been carrying around table tennis bats and balls since a visit to Decathlon a month ago). We've been finding time to fit in three meals a day though. On our first evening we made rabbit sifado, after getting over the shock that a whole rabbit in its entirety was in the tray purchased from Lidl. The rabbit cooked slowly with shallots, tomatoes, cinnamon and dill for five hours until it was every bit as good as we've had in a Greek restaurant. Daisies, clover and buttercups. These are the feint scents I can smell from the tree-dotted meadow Cleopatra spent last night and will remain for the next two. The wind is rustling through the trees but I can't feel it as I've moved my chair next to the hedge to enjoy my morning coffee in the sunshine. There's dew on the grass and so it's still a little early to bring out the picnic blanket on which I intend to spend the laziest, dreamiest of summer days. I can hear only birds chirping and the quietest clucking of the chickens around my feet. There have been probably half a dozen times I've thought 'this is why we bought a campervan.' This morning it's half a dozen plus one. Fast forward to 3pm. There are a few clouds in the sky but it's mostly sunny here at Domaine les Gandins. Our Eurotunnel crossing was booked for 8.50pm but we arrived at the Folkestone terminal at 6.07pm. We were offered a 6.50pm crossing and readily accepted. We had two and a half hours more to drive before our scheduled overnight stop and we were glad of the extra sleep these two hours would allow. The Aire at St Imoges was great. There were four other motorhomes parked for the night and we joined them. The forecast was for a dry night and so we popped the roof up and didn't bother fastening on our CaliTopper, the military-grade fabric cover we bought to keep the integral roof fabric pristine. 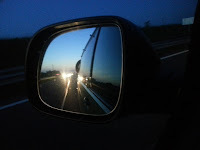 We went straight to bed and were up and on the road by 8.30am. The Sat Nav gave a time of arrival at our first campsite of our week's holiday as 2pm. It was dead on within ten minutes. This weekend we stumbled upon the camping world's best kept secret. 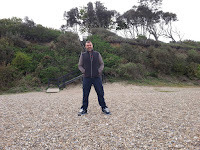 The campsite we stayed at is so well located, with steps down to miles of unspoiled Suffolk beach and just out of the way enough to be peaceful and quiet. It's so nice I don't think I want to tell you where it is. 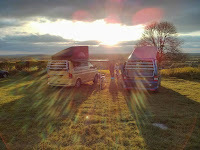 We were pitched by 6.30pm and enjoyed a few beers on a very mild evening, watching the sun go down through the trees. We moved indoors to cook a dinner of smokey sausages and paella rice, falling into our beds in a food and wine coma around 10pm. We woke up just before 9am and made coffee before showering in the brand-new shower block with underfloor heating. You don't often leave a campsite shower feeling 100 percent clean but here I did. I put on shorts for our planned walk and by 9.45am we were on the beach heading towards Southwold. 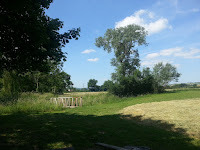 We spent a very blustery weekend at Town Farm campsite in Ivinghoe last week. 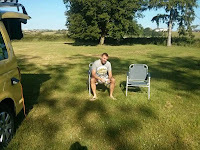 It was our second time on the site and this time we opted for a grass pitch without electric. The site enjoys stunning views over the Chilterns but the best views are from the perimeter of the site where there's no electric. This would have been all well and good had I not forgotten to pack one of the several bags of dry sticks we have at home! For off-grid cooking we use the brilliant Solo Stove Titan which needs only twigs and sticks to produce enough heat to cook. It had been raining and so the only sticks were were able to find were a little damp. It took some time to get the stove going but once well lit it functioned well with the fuel we were able to burn. A small amount of moisture in a twig is no match for a flaming inferno! We cooked salmon fillets and ate them with a lentil and quinoa salad, washed down with wine. This is where we've wanted to take our campervan ever since we've had her. 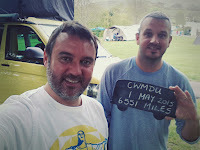 Cwmdu campsite in the Welsh Black Mountains is a site we have visited in a tent many times before and we like it for its back-to-basics simplicity. It's a smallish campsite on a gentle slope with basic facilities and a shop/reception that's open for one hour each morning and evening. Cwmdu is a tiny village in a valley and so the campsite also benefits from stunning views in all directions and hundreds of walking and cycling possibilities. This is our first visit in Cleopatra because the site only just opened for the season. May Day bank holiday seemed the ideal time for us to venture so far for just a weekend.